Good for you, good for others. Participate by logging your health behaviors August 22 – October 2. HealthTrails 2018 Results – We Did It! Every 20 miles you earn in the HealthTrails challenge will be turned into a life-saving meal packet for a child in need. Our goal was 50,000 packets and we did it! by logging your health behaviors August 22 – October 2 at chevron.healthtrails.com. For the second year in a row, every 20 miles you earn in the HealthTrails challenge will be turned into a life-saving meal packet for a child in need. Donations are capped at the million mile mark – that’s 50,000 meal packets. How many miles will you earn for the good of others? How many miles can you earn for the good of others? 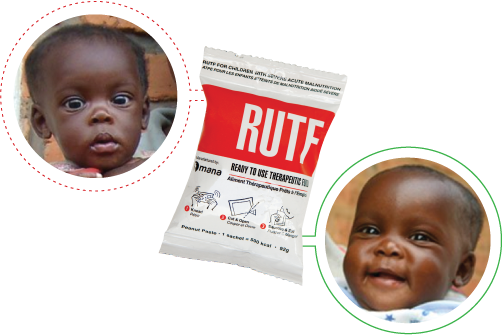 In the developing world, over 17 million children under the age of 5 suffer from SAM – Severe Acute Malnutrition, the most dangerous form of malnutrition. It causes 3.5 million deaths annually. We’ve partnered with some of the top world aid organizations to deliver this revolutionary solution, but we need your help. Your efforts during the challenge will be sponsored to help unlock life-saving packets. Unlock life-saving packets for children who need them most. Last year, Chevron HealthTrails participants earned enough miles to donate 50,000 life-saving meal packets to children suffering from malnutrition. The packets provided a full six-week treatment to over 300 children in South Sudan.